Durham United and TFCA came into this fixture with confidence as both teams picked up three points against top-four opposition in the previous round. Durham’s Le Rohne Young notched a hat-trick to help his side beat Windsor, and TFCA pulled off a comeback to beat Vaughn. With that said, one would have expected a closer battle between these two, but it was mostly one-way traffic. From kickoff, TFCA set the tempo of the game and it never looked likely to change. High pressure from TFCA forwards and a defensive line sitting a few yards behind half, forced Durham players to cough up possession frequently. It didn’t take long for their approach to pay off. After a series of intricate passes, League One’s top scorer, Molham Babouli, placed a shot into the top left corner in the seventh minute. It seemed Babouli was unplayable as he would go on to create a number of chances, displaying some impressive footwork. In the thirty-second minute, Matt Stowell tucked away an easy finish from a low cross, making it 2-0 for the Reds. On Durham’s end, if it wasn’t for some brilliant Eugene Alves saves, it could have easily been 4-0 by the end of the half. TFCA made sure to bring the same intensity and focus into the second half. Early on, Stowell raced down the flank and cut onto his right foot, only for his blasted shot to be saved by the crossbar. Stowell would get another chance at goal from a Dylan Sacramento through-ball but once again goalkeeper Alves came up big. Durham failed to show any signs of a potential comeback and was not particularly potent in the attacking third. Likewise, they failed to get Martino Dumevski involved from the flank and service for Young was non-existent. TFCA’s attacking was good, but their defensive game was even better. Oladapo Afolayan in particular, the center defensive mid for TFCA, consistently broke up play and protected his centerbacks. 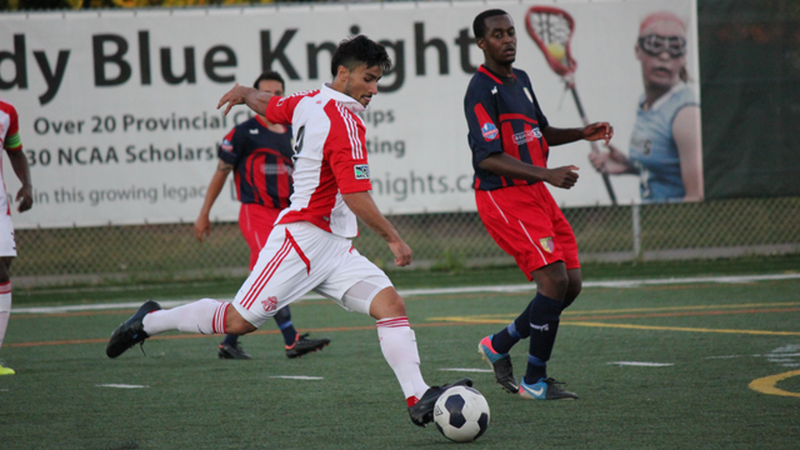 From the first minute until the last, TFCA looked sharp and were unlucky to only win by two. After the game, TFCA coach, Michael Stefano, stated that his boys are playing with maturity because the academy is not simply a chance to play soccer; it is a stepping stone to something greater. With regards to their style of play, Stefano noted that winning is important, but the real objective is to win by playing attractive football. A win for TFCA keeps them in first place at twenty-fou points, and leaves Durham in sixth at nine points. Babouli also extends his comfortable lead at the top of the scorer’s table to thirteen goals in ten games played.